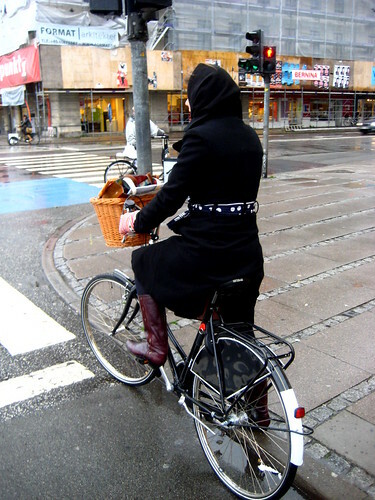 Nothing like a bit of Nordic backlightaciousness gracing a Copenhagener on a bike in killer heels. And then you have the Copenhagen version of The French Lieutenant's Woman. Classic style. And then there is Lululicious. She took a break at the playground to sit in the box of my Velorbis Long John. I haven't personalised it that much just yet. There are stickers for our Danish bike helmet website Cykelhjelm.org and a Slow Bicycle Movement sticker. And the shopping bag for the Slow Bike Movement, too, from the online store. I only really use the Long John for transporting the kids, but it is brilliant and practical. Old school charm, brand new bike. Will you cover the presentation about comme des garcons with h&m, in your particular bike style??? offtopic: is there any chance to buy cyclechic tees in europe? Is the odd belt on French Lieutenant's Danish woman's jacket reflective or equipped with little lights? Thinking that with the short November days as far north as you are (VERY far north of Montréal - we are at the same level as Lyon in France - nice having the Gulf Stream, eh?) she'd be leaving for work in the darkness, and keep the belt on. Is the Slow Bike Movement merchandise available in shops anywhere? Amsterdam or Paris would be better for me, as I go there rather often, but I could probably convince a Danish friend to buy the bag for me. Not interested in ordering online. hey raquel: Neither Commes des garcons or H&M are Danish! cycle chic tees are available online for everyone! no lights on the belt, lagatta... just polka dots. slow bike merch is only available online at the moment. That first 'Nordic backlight/killer heels' pic is gorgeous. So perfect that if I close my eyes I can imagine the sun's fading heat. Heat? Hehe, by november you see the sun, but you are not exactly overwhelmed by the heat. 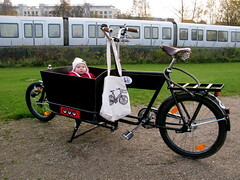 That longjohn looks tempting, - we have a three wheeled cargo bike, and it is c**p to ride, to be honest.